Rice vinegar is a mild flavored vinegar that comes with reduced acidity. This type of vinegar is used extensively in Asian cooking. You can use it in salad dressings. It is a good vinegar that is available in any Asian grocery store as well as many well-stocked grocery stores. It is not made from rice wine but simply from rice. That is why people commonly call it a “rice wine vinegar”. Rice vinegar is a traditional ingredient that is an accompaniment to sushi. At times, to complete a recipe, you will need a substitute for rice vinegar. Fortunately, nowadays, there are plenty of viable options that you can use as its alternative. Probably the reason why you have landed on this page is that you are looking for the substitutes for rice vinegar and well if this is the case then you are reading the right post. The fact is there are many kinds of vinegar that actually serve as alternatives to rice vinegar without the addition of sugar or water. Therefore, in today’s post, we have got you covered with the substitutes for rice vinegar. So, just take notes of what we are going to tell you because this post will actually be very helpful for you in the long run. Apple cider vinegar hits the top position in the list of substitutes for rice vinegar. It is a suitable alternative to rice vinegar that you can use in cooked dishes and most marinades. This type of vinegar is fruity as well as mild and it is made from fermented apple cider. Its effects on a dish are much the same as rice vinegar. 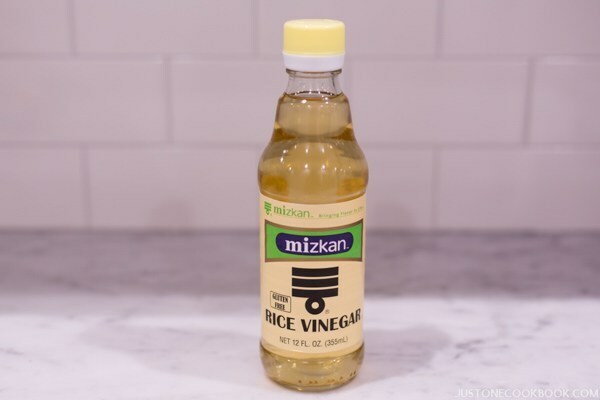 In fact, an apple cider vinegar adds an unwanted fruit flavor, therefore, try to avoid substituting this vinegar for rice vinegar in dressings and sushi recipes. After adding the apple cider vinegar, you need to add a pinch of sugar if the dish tastes too tart. Moreover, an apple cider vinegar has various impressive health effects. It also helps to optimize your digestive system. White vinegar is also a great substitute for rice vinegar but you will have to dilute it as it has a stronger flavor as well as the more pungent aroma as compared to rice vinegar. You can use white vinegar in cooked dishes. Moreover, it is much too harsh to use in most dressings as well as dips. Like apple cider vinegar, after adding white vinegar, you need to add a pinch of sugar if the dish tastes too tart. White vinegar is a flavorless variety of vinegar and is often known as a “virgin vinegar”. It is great for pickling as well as other less culinary applications. Rice vinegar and white vinegar have different flavors as rice vinegar is quite sweet and delicate while white vinegar is somehow sour and harsh. But you can use it extensively as an alternative to rice vinegar. Moreover, it can be used as a natural household cleaner too. On number 3, we have balsamic vinegar that is a bit less sweet and has more of a spicy tang. It is, in fact, an ideal alternative in salad dressings as well as marinades but it is not as good as a replacement in every meal. You can use balsamic vinegar with tortellini, salad, baked chicken as well as pizzas. Lemon or lime juice can be used as a substitute for rice vinegar especially in marinades, dipping sauces, salad dressings as well as stir-fry dishes. It also helps in marinating chicken and meat. Like rice vinegar, lemons and limes are both highly acidic, therefore, they can easily mimic the acidity of rice vinegar in most of the recipes. As lemon juice has a distinct citrus taste, so it can change the flavor of the final product. Moreover, you can also use double amount of lemon or lime juice just to add extra acidity to your recipe. Champagne vinegar is also an ideal rice vinegar replacement. You can use this kind of vinegar in salad dressings or dipping sauces as it is extremely mild and does not overwhelm the flavor of the salad ingredients or makes a dipping sauce too tart. A good thing here is that you can make your own champagne vinegar at home. For this, you just need to pour leftover champagne into a jar and leave it uncovered for about three weeks. After that, screw the top onto the jar of champagne. In this way, you can store the vinegar for up to six months in a cool and dark cabinet. Malt vinegar is a great alternative to the rice vinegar that you can use in savory, meat-based dishes, sauces as well as marinades.